This is the third time I’m writ­ing about a digital work by Flem­ish duo Tale of Tales, and that alone says some­thing about the capa­city of their releases to inspire dis­cus­sion. I star­ted with the peace­ful MMO The End­less Forest, and also did a short bit on The Grave­yard. Con­tinu­ing the chro­no­lo­gical trend would leave The Path as my next sub­ject - argu­ably their best and most game-like work - but writ­ing about that fas­cin­at­ing psy­cho­lo­gical hor­ror piece still seems rather daunt­ing. Instead, I’m stick­ing to the slightly more man­age­able FATALE and explor­ing a bit of what it has to say about the fig­ure of Salomé and how she’s been treated through­out his­tory. FATALE is best described as a digital art vign­ette, with an explor­able 3D scene at its centre, tak­ing Oscar Wilde’s ver­sion of the story as its main inspir­a­tion. The first scene is short and simple, and presen­ted from the per­spect­ive of John the Baptist or Jokanaan, as Wilde has it. John is stuck in the cistern, while above­ground, Salomé is per­form­ing her dance of the seven veils for Herod. While wait­ing for the dance to end, John is free to roam the cistern, and words he has proph­esied float around his head. After the dance ends, and Salomé has made her fam­ous request - though John doesn’t hear it - the exe­cu­tioner comes in, slays John, and the screen goes black. The main part of FATALE starts here. The scene is now out­side, the court­yard, at night, with the moon loom­ing largely over­head, as in Wilde’s play. It is not imme­di­ately clear whose per­spect­ive the ‘player’ has in this scene - I’ll return to this issue later. The pur­pose of this scene is to allow the player to explore the three-dimen­sional pic­ture Tale of Tales have made, with ambi­ent music, sound effects and eerie voices provided by Jar­boe and Kris Force, the duo that so suc­cess­fully scored The Path. It is some­thing of a sym­bol­ist piece, with props relat­ing to the story scattered around the court­yard: the musical instru­ments used dur­ing the dance, the exe­cu­tioner stand­ing guard, Salomé scattered veils, Salomé her­self look­ing out over the court­yard, the head of Jokanaan next to her on a plate, listen­ing to her iPod. There is a lim­ited form of pro­gress in the scene, in the form of snuff­ing out and steal­ing the dif­fer­ent lights on the scene: candles and lamps. Each cap­tured light can be used to revisit and explore parts of the scene, each more static, paint­ing-like snap­shots of the whole. When all lights are out, dawn breaks, and with the moon in sight, the view dis­sip­ates and the scene is over. This ends the pro­gram, but upon restart­ing it, the ‘final’ scene is play­able. 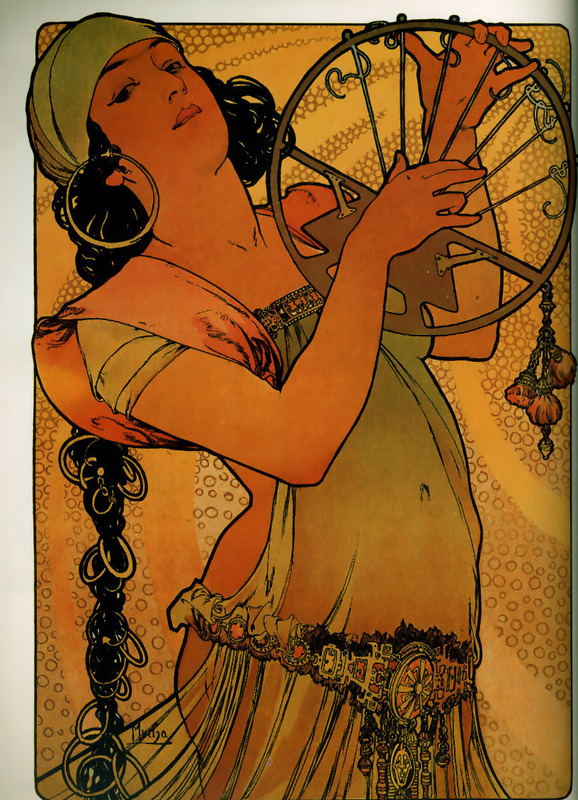 Again, it is the dance of the seven veils, but this time from the per­spect­ive of king Herod, for whom Salomé dances. This scene, set to music by Gerry de Mol, is bril­liantly done using roto­scop­ing of an actual dan­cer (Eléonore Valere Lachky), anim­ated by Laura Raines Smith, and it is most likely one of the best instances of dance art in a digital medium; you can view the mak­ing of the dance here: https://​vimeo​.com/​7​4​9​1​839. At the end of the dance, Salomé grace­fully ges­tures towards the cistern, indic­at­ing to the viewer the grue­some pay­ment she demands for her per­form­ance. 14 And king Herod heard of him; (for his name was spread abroad:) and he said, That John the Baptist was risen from the dead, and there­fore mighty works do shew forth them­selves in him. 15 Oth­ers said, That it is Elias. And oth­ers said, That it is a prophet, or as one of the proph­ets. 17 For Herod him­self had sent forth and laid hold upon John, and bound him in prison for Hero­dias’ sake, his brother Philip’s wife: for he had mar­ried her. 18 For John had said unto Herod, It is not law­ful for thee to have thy brother’s wife. 20 For Herod feared John, know­ing that he was a just man and an holy, and observed him; and when he heard him, he did many things, and heard him gladly. 22 And when the daugh­ter of the said Hero­dias came in, and danced, and pleased Herod and them that sat with him, the king said unto the dam­sel, Ask of me what­so­ever thou wilt, and I will give it thee. 23 And he sware unto her, What­so­ever thou shalt ask of me, I will give it thee, unto the half of my king­dom. 25 And she came in straight­way with haste unto the king, and asked, say­ing, I will that thou give me by and by in a char­ger the head of John the Baptist. 26 And the king was exceed­ing sorry; yet for his oath’s sake, and for their sakes which sat with him, he would not reject her. 28 And brought his head in a char­ger, and gave it to the dam­sel: and the dam­sel gave it to her mother. 29 And when his dis­ciples heard of it, they came and took up his corpse, and laid it in a tomb. It seems rather clear to me that in the bib­lical account, the plot revolves around Hero­dias. Herod is not par­tic­u­larly fond of John, but he fears the out­rage he will cause should the prophet be put to death. Hero­dias appar­ently has no such reser­va­tions, and she oppor­tun­ist­ic­ally uses Herod’s oath to her daugh­ter to have John executed, thereby tak­ing revenge for his con­dem­na­tion of their mar­riage. The motiv­a­tions of the unnamed Salomé are not explored, and for all the verses tell us, she is merely a girl or a young woman (inno­cently?) per­form­ing a dance routine. How­ever, two mil­len­nia is a long time for a char­ac­ter to evolve. That period sees the gen­eral depic­tion of Salomé trans­form from a rel­at­ively incon­spicu­ous player in a polit­ical con­flict to a sen­sual seductress, a player in a far more com­plic­ated mar­ital struggle, and a mad­wo­man. In renais­sance art, Salomé was already a favour­ite sub­ject of artists, though at this point, she was still presen­ted as a chaste young woman, often dressed accord­ing to the fash­ion of the time. I’ve selec­ted four examples, which are view­able below. Though of course bib­lical themes were obvi­ous choices for paint­ers, it seems this scene spoke to the ima­gin­a­tion in par­tic­u­lar, which is a test­a­ment to the power of the story, even in its sum­mary bib­lical form. 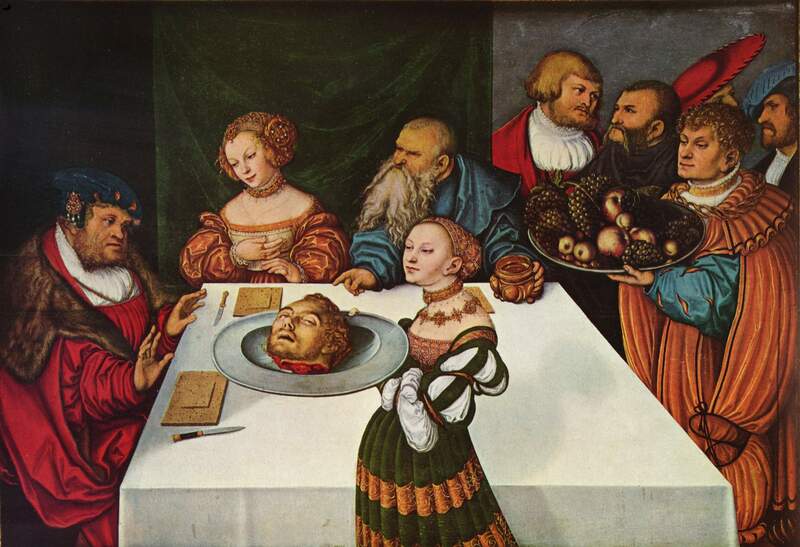 The ‘shot’ where Salomé presents John’s head on a plate is indeed a power­ful image. Accord­ing to Wiki­pe­dia, Chris­tian tra­di­tions “depict her as an icon of dan­ger­ous female seduct­ive­ness”; how­ever, this obser­va­tion is unsourced, and to me not dir­ectly vis­ible in the paint­ings pred­at­ing the 19th cen­tury. As far as I can see at the moment, her icon­isa­tion and sexu­al­isa­tion only really took off with a renewed interest in her char­ac­ter in the second half of that cen­tury. In 1877, Gust­ave Flaubert, around the time of Mor­eau’s paint­ings, pub­lished a short story entitled “Hero­dias”. This is one of the first elab­or­a­tions on the story, and of great influ­ence on later works. In it, the polit­ical mach­in­a­tions of Herod’s court are depic­ted in much more detail, as well as Hero­dias’ motiv­a­tions for want­ing the death of John. More import­antly for the ana­lysis here, in Flaubert’s ver­sion Hero­dias act­ively grooms Salomé to be seduct­ive, as part of her scheme to move Herod to have John executed. Salomé her­self is still more of an accom­plice than an inde­pend­ent actor, though this is one of the first sources where she is expli­citly sexu­al­ised. Cru­cial for the fur­ther devel­op­ment of the fig­ure of Salomé, as already men­tioned, was Oscar Wilde’s one-act play. Ori­gin­ally writ­ten in French and pub­lished in 1891, it is no doubt the most fam­ous mod­ern inter­pret­a­tion of the story, not in the least because of the illus­tra­tions of Aubrey Beard­s­ley, which accom­pany many edi­tions. As Nancy Thu­leen points out in her essay on the play, Wilde drew heav­ily on earlier 19th cen­tury ver­sions of the story, as well as Moreau’s paint­ings, but one of the things that makes his ver­sion spe­cial is that he makes Salomé, rather than her mother or someone else, cent­ral to the plot. How good to see the moon! She is like a little piece of money. You would think she was a little sil­ver flower. The moon is cold and chaste. I am sure she is a vir­gin, she has a virgin’s beauty. Yes, she is a vir­gin. She has never defiled her­self. She has never aban­doned her­self to men, like the other god­desses. How wasted he is! He is like a thin ivory statue. He is like an image of sil­ver. I am sure he is chaste as the moon is. He is like a moon­beam, like a shaft of sil­ver. His flesh must be cool like ivory. I would look closer at him. She con­tin­ues to observe his body, dis­cov­er­ing hideous aspects in him as well, but ulti­mately she desires a kiss of him, which he of course does not grant her, spurn­ing her for being a “daugh­ter of adul­tery”. The rest of the story is clear: Herod lusts after Salomé and she rebuffs his advances. 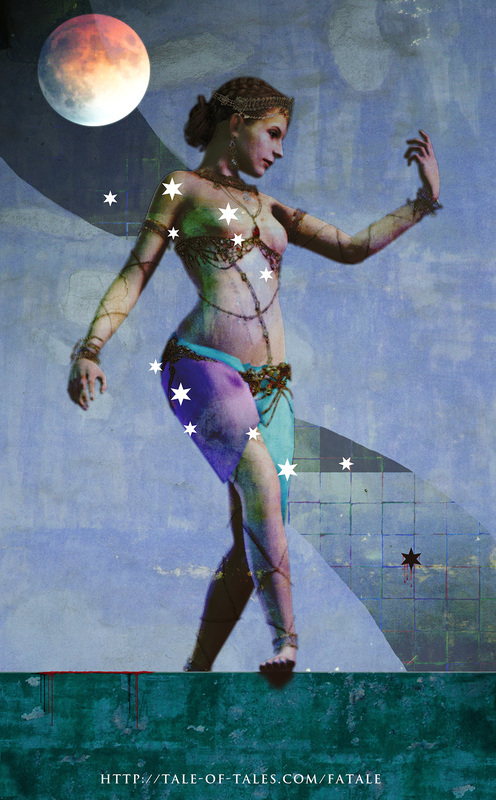 Only when Herod prom­ises her whatever she wishes does she con­sent to dance for him. After the dance, she asks for John’s head, this time without her mother’s urging, though of course Hero­dias approves of her daughter’s choice. 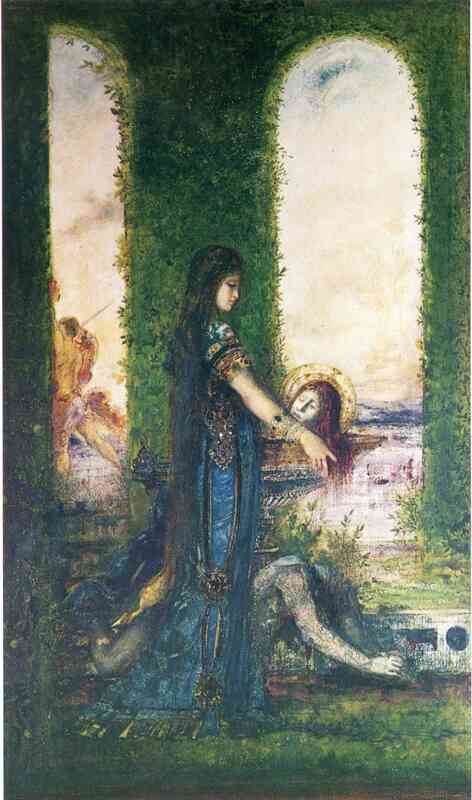 In the cli­max of the play, before she is killed by mad Herod’s guards, Salomé gets her kiss from the severed head of John the Baptist. Since Wilde’s play and the Richard Strauss opera adapt­a­tion, I don’t think there have been any rad­ical changes to the Salomé story, at least not in ways that have trans­formed the gen­eral view as much as the 19th cen­tury artistic cur­rents have. Back to FATALE. It’s a remark­able work of art how the rel­at­ively static scene cre­ated by Tale of Tales pos­its many of the ques­tions I have addressed in this art­icle. Its Salomé is inscrut­able, the way she leans over the wall, listen­ing to her music. She stares dir­ectly at the empty throne of Herod, as if dar­ing her absent step­father to react. Hero­dias stand statuesquely to the side, watch­ing her daugh­ter. Surely some ter­rible thing will befall. Man­as­seh, Issachar, Ozias, put out the torches. I will not look at things. I will not suf­fer things to look at me. Put out the torches! Hide the moon! Hide the stars! Let us hide ourselves in our palace, Hero­dias. I begin to be afraid. Many of the vant­age points in the scene are centered around the fig­ure of Salomé, allow­ing the dis­em­bod­ied viewer to study her form in detail, much like the desire of Herod. In one of the final tableaux, a gust of wind can even draw off Salomé’s final veil, which she has lazily drawn about her­self. 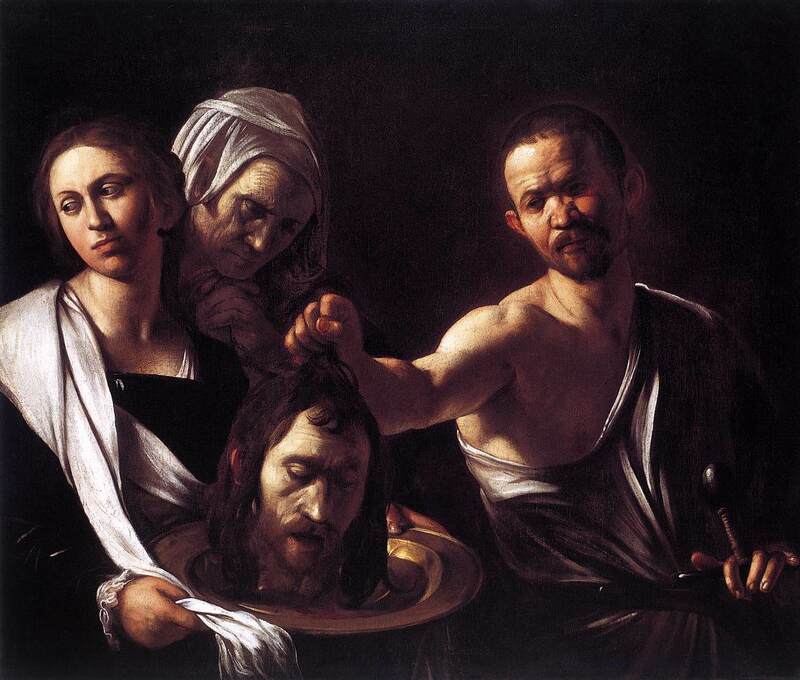 At the same time, John’s bloody head is always close at hand to remind one of the price of Herod’s desire. A pic­ture glimpsed through the heavy door behind Salomé per­haps reveals another clue: a king’s por­trait, head aver­ted in shame. Without at least a basic know­ledge of the story of Salomé, FATALE will per­haps be a bit obtuse to play. How­ever, with the proper back­ground - this art­icle is more than enough - you will be able to enjoy the inter­est­ing per­spect­ives that this digital art piece offers. Unlike films or many proper video games which rely heav­ily on nar­rat­ive drive, a piece such as this allows for a calmer con­tem­pla­tion of a nar­rat­ive already vaguely known, but seen from a new per­spect­ive. As the older paint­ings seek to invite the audi­ence to think back to the bib­lical story, so does FATALE draw the player into think­ing about the his­tory of Salomé, while explor­ing its visual and musical lan­guage.